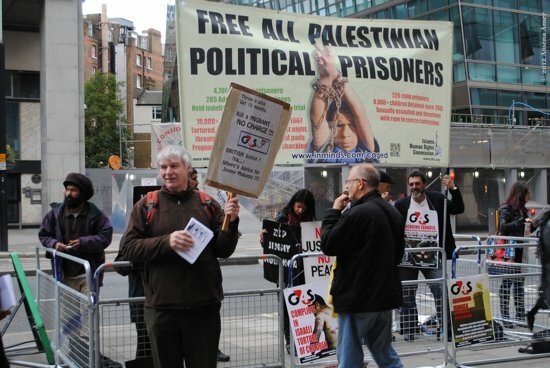 On Friday 12 October 2012, 30 human rights activists convened outside the G4S London Headquarters to protest G4S’s complicity in the torture and caging of Palestinian children. G4S is a British-Danish security firm. Among some of the provisions made by G4S to the Israeli security apparatus include a perimeter defence system and command control centre for Ofer prison in occupied Palestine, and security systems for the al-Jalame interrogation centre in Israel. Ofer and al-Jalame are notorious for having housed Palestinian children in solitary confinement. The internment of children in solitary confinement, as well as their interrogation and torture, is made possible by the technological and logistical support provided by G4S. G4S have also provided support to illegal Israeli settlements in occupied Palestinian territory, and have business interests in maintaining Israeli checkpoints and the Apartheid Wall. Activists held placards and banners outside the G4S HQ despite the adverse weather conditions. Many passers-by were visibly shocked to hear of the torture of children by Israel and G4S’s complicity towards Israel’s crime. Many of them were very disturbed on learning of the consequences of G4S’s involvement and some joined the protest and requested to be kept informed of forthcoming protests.